A snow storm that began today and will continue Thursday (Nov. 16) is a welcome site for both Heavenly Mountain Resort and Squaw Valley Alpine Meadows ski resorts, who have a planned opening Friday. 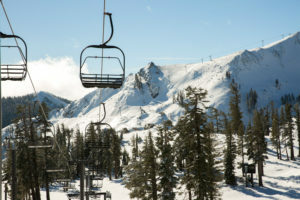 Some early snow and cold nights for snow-making has aided Squaw Valley, which will open for the season November 17. With more snow predicted, Heavenly Mountain expects to add to the 5 inches of snow it has received thus far. Regardless of how much snow it receives, Heavenly will be running lifts Nov. 17 for the first time this season, thanks to its massive snow-making capability. The two other Vail Resorts in Lake Tahoe are also expected to open soon for skiing and snowboarding. Northstar California pushed back its projected opening day from Nov. 17 to Thanksgiving Day (Nov. 23). Kirkwood Mountain will start running its lifts for the 2017-18 season on Nov. 22. Squaw Valley Alpine Meadows was reporting a 14-inch base Wednesday and was expecting to add to that total overnight and Thursday. Already open this season are Lake Tahoe ski resorts, Mt. Rose Ski Tahoe and Boreal Mountain. Thanks to some cold evening temperatures, many Lake Tahoe ski resorts have begun making snow. The list includes Sugar Bowl and Diamond Peak. Although the Thanksgiving holiday is an important time for Tahoe ski resorts, many of them will be waiting until December. Sierra-at-Tahoe needs more man-made snow before announcing an opening date. 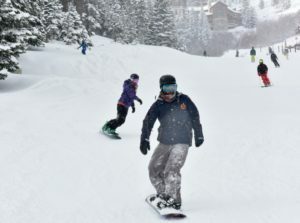 Despite receiving the most snow in the region – 32 inches – Sugar Bowl is in no rush to announce an opening date. “We are hoping to open as soon as possible, but want to ensure we can provide a quality top-to-bottom experience for our guests,” said Jon Slaughter, Sugar Bowl’s Director of Marketing & Sales. Heavenly Mountain will open November 17. The popular South Lake Tahoe resort will be the first Vail Resort to open in the Tahoe region. For more than a decade, Boreal Mountain was typically the first Lake Tahoe-area ski resort to open for the season. However, that role has been taken over by Mt. Rose, a Nevada resort near Lake Tahoe that has been first the last three seasons – this year for two days (Oct. 27-28), before shutting down for more than a week. Mt. Rose reopened Nov. 7, becoming the first Tahoe ski resort to open for the season. Located off Interstate 80 at the Boreal Ridge Road/Castle Peak exit, Boreal Mountain opened for the season one day after Mt. Rose, offering one lift Nov. 8, thanks to 15 inches of snow over the previous weekend and its snowmaking effort. Although not the first in the Tahoe region, Boreal was the first California ski resort to open this season.